The use of barbell is the best way to tone and strengthen most of the major muscles of your body including the biceps, triceps, quadriceps, deltoids, trapezius, rhomboids, pectorals, latissimus, dorsi, calves, glutes and hamstrings. There is a lot of core strength required to lift heavy Weight Sets Review along with stability to give your abs a great workout too. Thus, increasing abdominal workout by incorporating exercises such as barbell side bend and barbell trunk rotation. 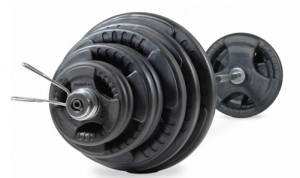 One of the most common drawbacks weight trainers use to mention consistently, is with barbells which are having a clumsy nature of changing the weight plates. 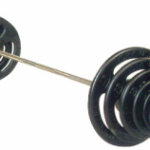 But the new invention by Bodymax has solved that issue too by creating an Olympic Rubber Radial Barbell Kit. 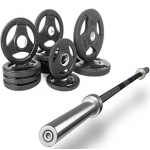 Designed with intensecreativity, this barbell kit shows off an attractive rubber coated radical design with radial grip that making loading, unloading and lifting of the bar quiet easier and safer. Giving you a secure and convenient environment, you can easily do your workout very smoothly without any interruption. The Bodymax 100kg Olympic Radial barbell kit consists of a one piece, seven-foot-long Olympic barbell, with a pair of spring locking collars and a wide range of weight plates in different sizes which gives you independency to perform many effective upper and lower body exercises. When it comes to weight lifting, barbells are easily the most used choice amongst fitness lovers as they give you much more ease and comfort than fixed weight machines. Thanks to the Bodymax Olympic Rubber Radial Barbell Kits, which make it possible to make your workout more challenging and reaching your fitness goals easily as possible. The plates are coated with a special type of rubber which will prevent the floor from damaging and certainly will produce noise reduction. 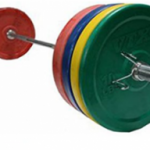 The product is named Olympic format weight lifting because of the dimensions and length of Olympic bar and plates. The Olympic bar has a diameter of two inches whereas Olympic weights consist of a hole in center of each plate of over two inches to make the weight completely slide down without any hesitation and oiling. In a weight set there are, two 15kg plates, two 10kg plates, four 5kg plates, four 2.5kg plates and one pair of Olympic spring lock collars. Also, the grip is designed and etched in such a way to make the weight safe and easy from loading and unloading of the bar. All disc sizes come in black color, while if you want additionally larger disc sizes, they are also available in different color coded options like, 10kg is for green, 15kg is for yellow, 20kg is for blue and 25kg is for red. One of the advantages of the Bodymax 100kg Olympic set is that it consists of a seven-foot-long barbell, which makes it suitable to perform a wide range of workouts like cages, benches and squat racks. When it comes to talk about its bar design, etching has been done in majority of the areas inside the collars which are broken down into two smooth sections.The smoother sections are known as guides, so that you can place your hands keeping the same distance apart every time you perform a certain exercise. The etching has been done to make the grip of your bar much improvedespecially, while performing pull up type exercises, such as deadlifts and barbell rows. The collars are very easy to use and are lighter, than some of the clamp type locking collars, so no need to take their weight into consideration while calculating how much plates you have added on the bar. 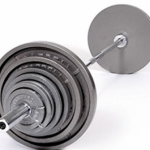 There are two main options to choose, if you are looking about purchasing a new barbell set for use at home; one with uncoated Weight Sets Reviews plates i.e. stainless steel or cast iron, and one where the plates are coated with rubber or paints. Though the size of the weight plates is increased with rubber coating plates but they still have several benefits.Firstly, to create the 3 groups of 5 recesses the rubber is molded, on each plate which makesitmuch easier to grab from the floor and then load onto the barbell. The rubber coating also protects the floor where you are working out, thus it is recommended to use power cage or bumper plates if you are dropping the plates from a certain height like in CrossFit.Having a comfortable, softer material of rubber as compared to cast iron the plates have a minor chance of getting damaged when placed on the floor or fully loaded on the bar. Body Max are the manufactures of this equipment. Gives a free UK Delivery. Gives a one year warranty of full commercial, light commercial and home gym. The weight of the product is 140kg. Over 600kg is the maximum user weight. No folds storage are present with the package. 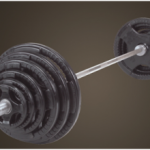 Rubber coated radial disc design makes the lifting and loading unloading weights onto the bar much easy. Four 1.25kg are added freely, without any cost. Two 15kg rubber radical disks, two 10kg rubber radical disks, four 5kg rubber radical disks, four 2.5kg rubber radical disksare present in a package of 140kg. One pair of Olympic spring lock collars isalso included. Plates are rubber coated to protect them from floors and also reduce noise along with having rust. The bar is very comfortable and easy to hold due to the size and shape of the grip handles along with the softness of rubber. Shipment takes less than a week which is very agreeable. One year warranty on all of the parts is given. Very Durable due to rubber coated design. Plates produce a very low impact noise which makes the user to workout with good movement and smoothness. Strong rubber odor is present from the plates at the time of shipping.